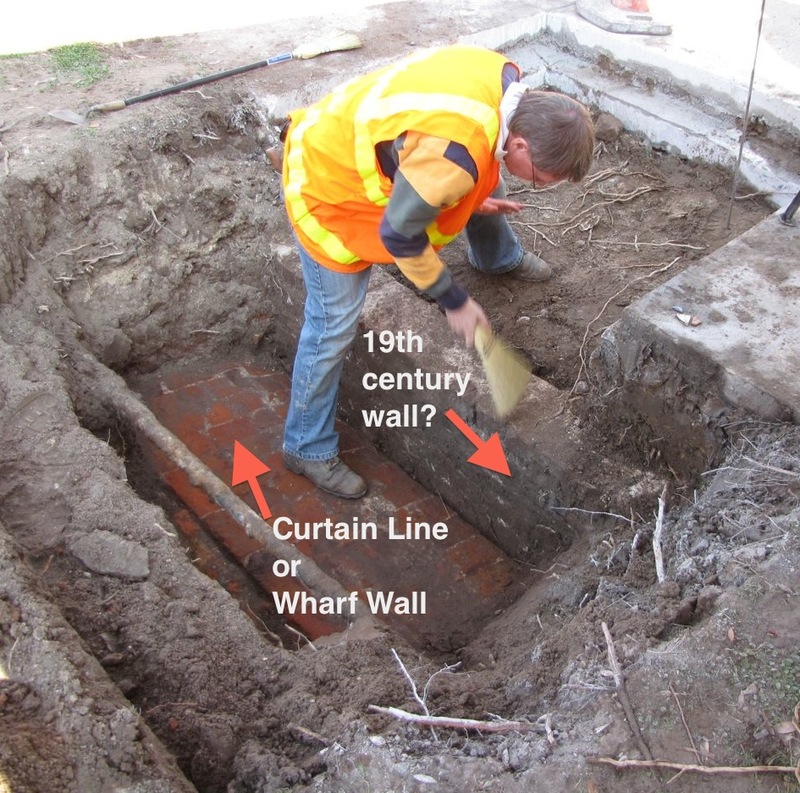 On Wednesday, January 23rd, a section of colonial Charleston’s waterfront “curtain line” or “wharf wall” was exposed, measured, and mapped for the first time. This happy event took place during a one-day dig sponsored by the Charleston Water System, a Task Force member who had recently conducted utility work in the vicinity, and generously offered to supply labor and equipment for a brief exploratory dig. 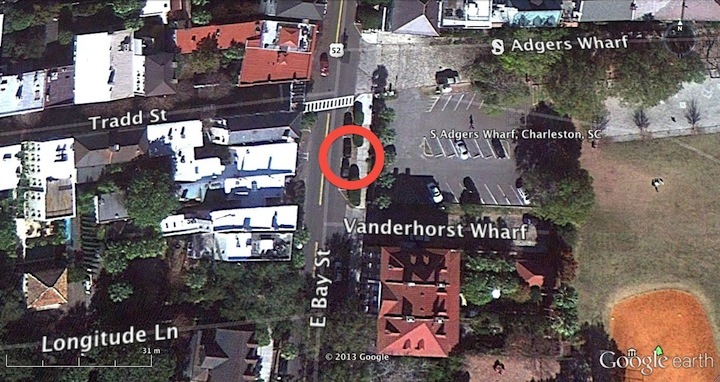 The site chosen was a small patch of asphalt, grass, and concrete sidewalk on the east side of East Bay Street, just a few yards south of South Adgers Wharf. 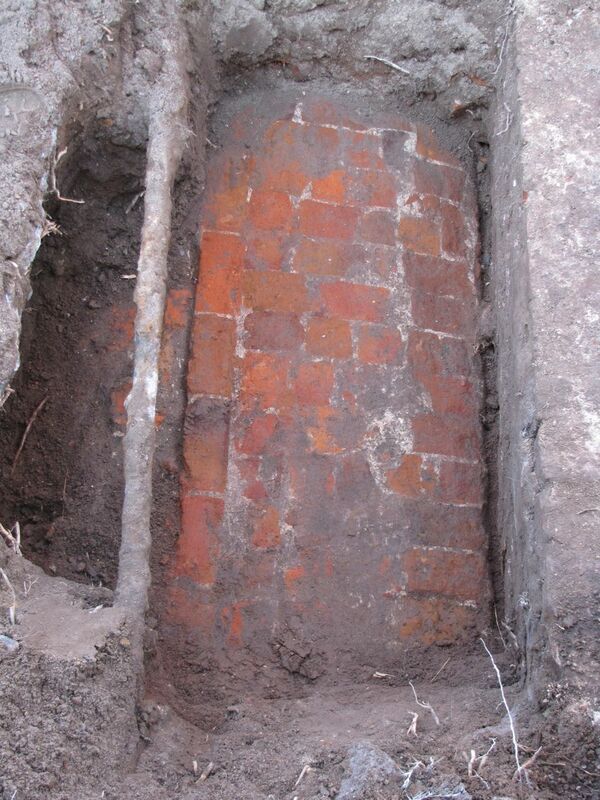 Excavations at that site in 2008 and 2009 revealed the remains of the redan or salient angle that once stood at the east end of Tradd Street, but neither of those digs extended sufficiently westward to locate the brick curtain line that tied into the redan. 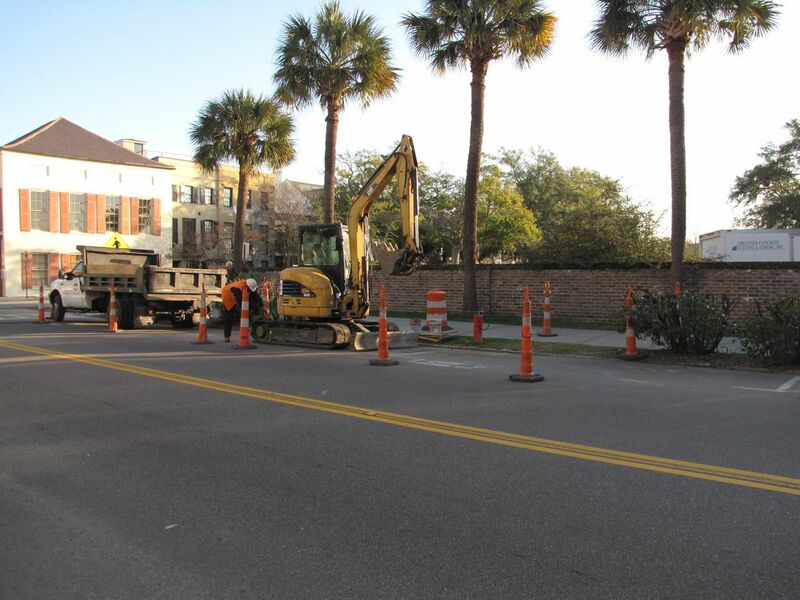 Early Wednesday morning, a crew of streetscape specialists from Anson Construction cut out a rectangular slab of asphalt from the east parking lane in East Bay Street. Using a backhoe to excavate the earth below the paving, the crew found no sign of the old wall. Moving farther to the east, the crew removed a square section of the concrete sidewalk and found a curious brick wall, only one brick thick, running parallel to the street and sidewalk approximately one foot below the modern grade. The size and color of these bricks suggest a nineteenth-century vintage, but the purpose or origin of this wall is currently unknown. Finally, the Anson crew used the backhoe to remove the narrow patch of grass and earth located between the street curb and the sidewalk. Approximately 1.5 feet below the aforementioned wall, we encountered the top surface of the old brick curtain line. This colonial-era wall, initiated by an act of the South Carolina legislature in 1694, runs parallel to modern East Bay Street, and in this specific site is literally sandwiched between the street curb and the sidewalk. It once stood approximately six feet above the street, but after being demolished down to street level in 1785, it’s now more than two feet below grade. The present top surface is approximately 26.5 inches wide, which is roughly half the width of the nearby redan walls excavated in 2008 and 2009. The bright red and orange bricks and the bright white mortar are an exact match to the colonial fortification materials found at the Tradd Street Redan, the Half-Moon Battery, and Granville’s Bastion. Once the top of the old curtain wall was located and its identity confirmed, the exposed portion was measured, photographed, and mapped by archaeologists and Task Force members Martha Zierden (of the Charleston Museum) and Eric Poplin (of Brockington and Associates). Immediately afterward, the wall was covered with earth and the sidewalk and street repaved. The wall is now hidden below the surface again for its own protection, but the data gathered during this brief exploration will contribute greatly to the ongoing effort to map the remnants of Charleston’s colonial fortifications with great precision. In future, a few more similarly brief, shallow digs along the east side of East Bay Street would allow us to positively locate the entire length of old “wharf wall,” which once stretched approximately 2,566 feet along our waterfront. The Task Force extends its thanks to Charleston Water System for its generosity and to the crew from Anson Construction for their enthusiasm. We eagerly look forward to future collaborations! It’s remarkable to see so much of the Cooper side fortification so intact between Granville Bastion and Half Moon. Aside from the geometry of their locations, what other considerations guide the selection of excavation sites for “generic” below-street-level wall segments like this one? Are the structures known to be intact in certain stretches, has this been good luck, has the WCTF got a PETScan machine on loan from MUSC, …? A major factor in determining the location of last week’s dig was the fact that Charleston Water System, in the course of their normal duties, had already obtained the necessary permits to dig in that specific location! Rather than aiming to find the intersection of the redan and the curtain wall, and risk being too far north and thus finding nothing, we decided to dig a few yards farther south where success was almost certain. Armed with a better understanding of the curtain wall’s location, we can now be a bit more discriminating about future targets for finding the rest of this wall. Rather than uncovering all 2,566 feet of the curtain wall, we want to find a series of spots that will allow us to “connect the dots” along its entire length. Personally, I would like to identify the precise location of the curtain wall in ten spots: on the north and south sides of Granville’s and Craven’s Bastions, respectively, on the north and south sides of the Half-Moon Battery, and on the north and south sides of each of the three redans along the Bay. So far, we’ve found two of those spots, but mapped only one. The more of these sites we investigate, the better we can narrow the field of possibilities.